Regenerating Night Cream is a product developed for women over 40, whose skin is dried out, tired and lacking firmness, with visible wrinkles and discolorations. 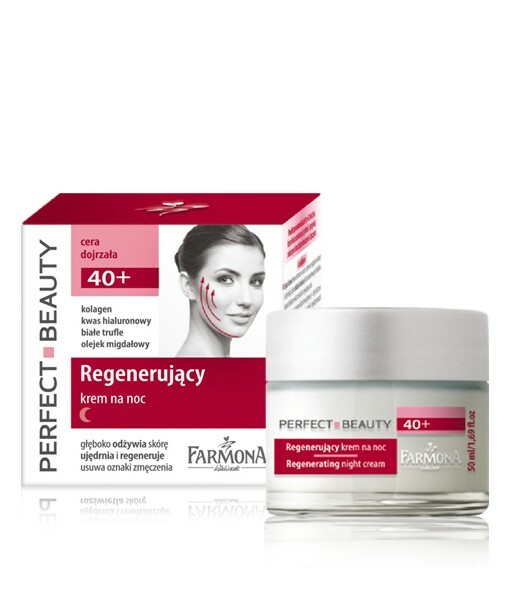 The rich cream formula created on the basis of the latest achievements of world’s biotechnology, thanks to a unique combination of highly concentrated active ingredients, effectively fights the effects of the passage of time. Peptide HA – advanced component of the new generation – through a combination of hyaluronic acid and microcollagen intensively smoothes wrinkles, and improves the structure and elasticity of the skin, preventing it from sagging. Ginger nourishes and oxygenates the skin. White truffles instantly smooth mimic and static wrinkles, reduce blemishes and improve skin elasticity. Almond oil strengthens the lipid barrier and prevents loss of natural moisture, as well as softens the skin, accelerates skin regeneration and inhibits the aging process. Your skin is perfectly nourished, revitalized and deeply moisturized. Mimic and static wrinkles are visibly shallower. The skin takes on a beautiful colour, is rested and relaxed, looks younger. Every evening massage the cream into the skin of the face, neck and cleavage. Microcollagen, hyaluronic acid, white truffles, almond oil. Aqua, Isopropyl Palmitate, Polysorbate, Cetearyl Alcohol, Cyclomethicone, Glycerin, Hyaluronic Acid, Soluble Collagen, Prunus Amygdalus Seed Oil, Stearic Acid, Propylene Glycol, Zingiber Officinale Extract, Caprylic/Capric, Triglyceride, Ppg- 15 Stearyl Ether, Tuber Aestivum Extract, Glyceryl Stearate, Cetyl Alcohol, Panthenol, Tocopheryl Acetate, Parfum, Dmdm Hydantoin, Methylchloroisothiazolinone, Methylisothiazolinone, Acrylate /C10-C30 Alkyl Acrylate Crosspolymer, Disodium Edta, Sodium Hydroxide , Bha.